Perfect kids handspring and walkover trainer for gymnastics studios or for safe at-home practice. Teaches proper technique for back handsprings, back walkovers, front handsprings and front walkovers. Design allows for controlled rotation. The Large Smarter Spotters are 32" wide and available in 3 heights to accommodate a variety of students. These models also include a FREE chock stabilizer that easily attaches to the Smarter Spotter and to the Carpet, keeping the spotter in place and allowing you to do vault training drills. Due to their larger size, these spotters must ship via truck and therefore require a shipping quote. 30" Model - 30"x30"x32" Wide - Green with Yellow Sides - Best for gymnasts 48" to 57" tall. 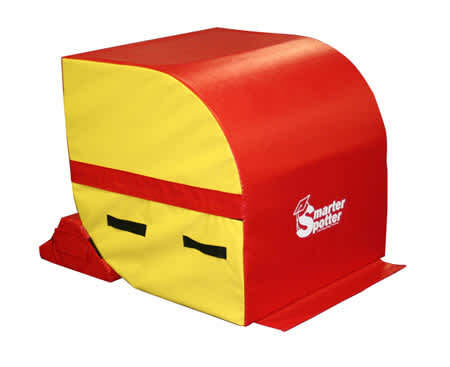 35" Model - 35"x35"x32" Wide - Red with Yellow Sides - Best for gymnasts 57" to 66" tall. 40" Model - 40"x40"x32" Wide - Royal Blue with Yellow Sides - Best for gymnasts 66" and taller. The Smarter Spotter is particularly popular as a kids tumbling trainer. 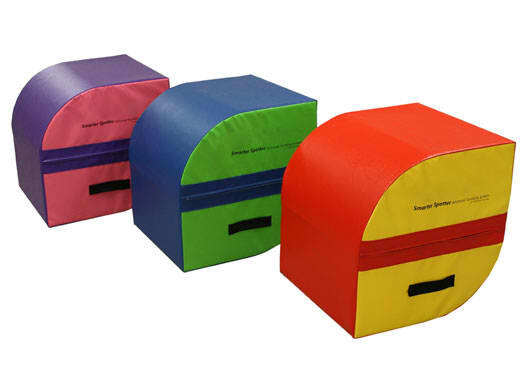 It's the perfect gymnastics or cheer handspring trainer for studios or for safe teaching of children at home. Ideal for practicing controlled training of front and back handsprings as well as front and back walkovers. This is a multi-functional piece of gymnastics equipment.